Edgar Jaime Magdaleno Gomez and Jose Maria Salazar Dominguez are both currently 6-2 in the Central America WCQ, and now they’re facing of in this Round 9 Feature Match! 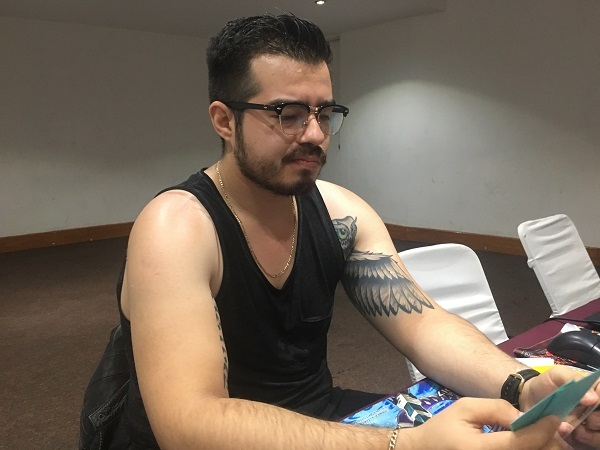 Edgar Jaime Magdaleno Gomez is packing a Dinosaur Lightsworn Deck, while Jose Maria Salazar Dominguez is piloting Sky Strikers. With only 2 Swiss Rounds remaining in the tournament before the Top 64, both of them are looking for two consecutive wins in order to secure their spot in the Top Cut. It’s time to Duel! 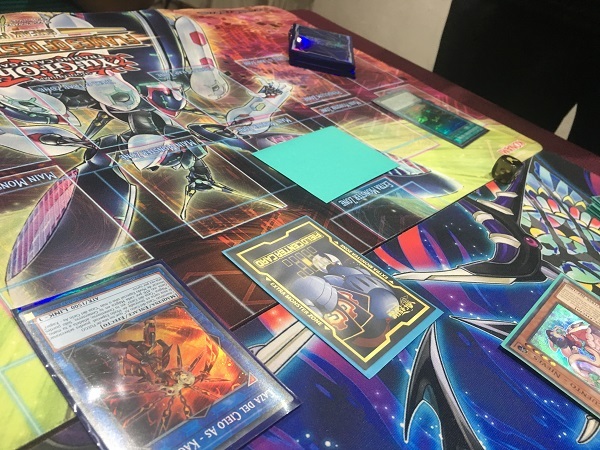 Salazar started off the Duel by activating Toon Table of Contents to grab another copy from his Deck, and then used that copy to get Toon Cyber Dragon, allowing Magdaleno to deduce that the third copy of Toon Table of Contents was in his hand. Next, he Summoned Sky Striker Ace – Raye and used it as a Link Material to Summon Sky Striker Ace – Shizuku. He Set a card to his back row and then added Sky Striker Mobilize – Engage! to his hand with Shizuku’s effect in the End Phase. Magdaleno opened up Duel 1 with Fairy Tail – Snow, Monster Reborn, Performage Trick Clown, Double Evolution Pill, Ultimate Conductor Tyranno, and Lyla, Twilightsworn Enchantress. He activated Monster Reborn to Special Summon Raye from Salazar’s Graveyard to his field and then Normal Summoned Performage Trick Clown. He combined his two monsters to Xyz Summon Minerva, the Exalted Lightsworn and used her effect by detaching Trick Clown to send the top 3 cards of his Deck to his Graveyard. He Special Summoned Trick Clown back to the field, giving up 1000 Life Points, and then activated Double Evolution Pill! He banished a Souleating Oviraptor that he had sent to his Graveyard with Minerva and banished the Lyla from his hand to Special Summon Overtex Qoatlus from his Deck and then attacked over Shizuku with his Qoatlus. He attacked directly with Minerva, dropping Salazar down to 5000 Life Points. Salazar activated Sky Striker Maneuver – Afterburners! to destroy Qoatlus, and Magdaleno used his monster’s effect to add a Double Evolution Pill from his Deck to his hand. 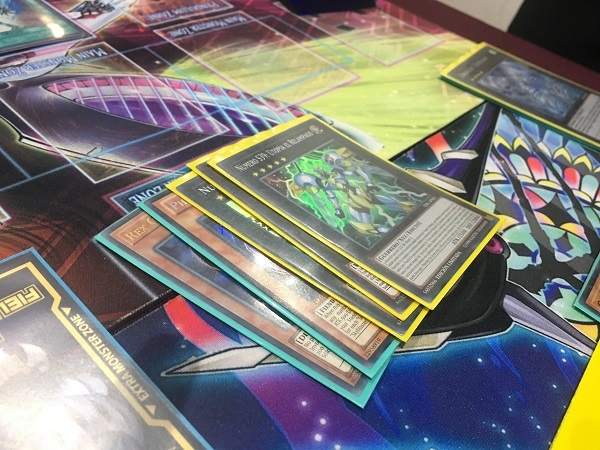 Next, Magdaleno activated Sky Striker Mobilize – Engage! and used its effect to add Sky Striker Airspace – Area Zero to his hand and draw a card. He activated Air Space, Set a card to his back row, and then used his Air Space’s effect to add a Sky Striker Mobilize – Engage! from the top of his Deck to his hand and destroy the Toon Table of Contents he had just Set. Salazar activated Sky Striker Mobilize – Engage! next, adding Sky Striker Mecha – Widow Anchor from his Deck to his hand and drawing another card. He activated Widow Anchor to negate Minerva’s effect and take control of it, and then Normal Summoned Raye. He attacked Trick Clown with Raye to destroy it, and Magdaleno Special Summoned it back to the field by giving up 1000 Life Points. Next, Minerva attacked and destroyed Trick Clown. Salazar then used his Raye’s effect to Tribute it and Special Summon Sky Striker Ace – Kagari from his Extra Deck. He used Kagari’s effect to add Sky Striker Mobilize – Engage! from his Deck to his hand and then attacked directly with it. He combined Kagari and Minerva to Link Summon Knightmare Phoenix next, and then used Engage to add another Widow Anchor to his hand and draw a card. Next, Salazar activated Sky Striker Mecha – Shark Cannon to banish Qoatlus from Magdaleno’s Graveyard and Set a card to his back row. Magdaleno drew Called by the Grave, adding it to his hand of Double Evolution Pill, Fairy Tail – Snow, and Ultimate Conductor Tyranno. He activated the Double Evolution Pill, banishing the Tyranno from his hand and the Trick Clown from his Graveyard, and Special Summoned an Ultimate Conductor Tyranno from his Deck. He Normal Summoned Fairy Tail – Snow next and attacked Knightmare Phoenix with his Tyranno to destroy it. He attacked directly with Snow next, dropping Salazar down to 1550 Life Points. He Set Called by the Grave and passed. Salazar flipped up Widow Anchor to negate the effect of Ultimate Conductor Tyranno and take control of it, and then Normal Summoned Raye. Magdaleno flipped Called by the Grave to banish a Raye from Salazar’s Graveyard, and then Salazar Link Summoned Kagari and used its effect. He attacked Snow with Kagari to destroy it, and then tried attacking with Ultimate Conductor Tyranno; but Magdaleno used the effect of the Snow in his Graveyard to Special Summon Snow and put the Tyranno face-down. Next, Salazar used the effect of his Air Space to try to destroy the Tyranno and add a Sky Striker card to his hand, but he didn’t reveal a Sky Striker card in the top 3 cards of his Deck! He activated Upstart Goblin next, and then used Terraforming to add an Area Zero to his hand. Since Area Zero’s effect can only be used once per turn, he had no way of destroying the Ultimate Conductor Tyranno! Realizing that it would be returned to Magdaleno in the End Phase and then wipe out the rest of his Life Points, Salazar conceded. Ultimate Conductor Tyranno allows Edgar Jaime Magdaleno Gomez to take a come-from-behind victory in Duel 1! Salazar started off Duel 2 by activating Toon Table of Contents to add another copy to his hand, and then activated that copy to add a third Toon Table of Contents to his hand. He didn’t activate the third copy, allowing Magdaleno to deduce that Toon Cyber Dragon was in Salazar’s hand. He Set a card to his back row and passed. Magdaleno opened up with Souleating Oviraptor, Monster Reborn, Wulf, Lightsworn Beast, PSY-Framegear Gamma, and Lumina, Twilightsworn Shaman. He Summoned the Oviraptor and activated its effect to send Giant Rex from his Deck to his Graveyard. He activated Monster Reborn to Special Summon the Giant Rex. He combined his 2 monsters to Xyz Summon Tornado Dragon and then detached an Oviraptor to activate its effect and target Salazar’s face-down Shark Cannon. Salazar Chained it to banish the Oviraptor from the Graveyard. Salazar activated Sky Striker Mecha Modules – Multirole. He Set a card to his back row and then used the effect of Multirole. Magdaleno Chained his Tornado Dragon’s effect, trying to destroy Multirole; but Salazar Chained the effect of PSY-Framegear Gamma from his hand! He Special Summoned it along with PSY-Frame Driver from his Deck, negating the effect of Tornado Dragon and destroying it! Multirole destroyed Toon Table of Contents. Salazar Tuned his 2 monsters together next to Summon PSY-Framelord Omega. He Set a card to his back row and then used his Omega’s effect to try to banish a card from Magdaleno’s hand; but Magdaleno Chained his own Gamma to Special Summon Driver from his Deck and negate it, destroying Omega! Gamma and Driver were banished in the End Phase. Magdaleno drew Double Evolution Pill and activated it to banish Giant Rex and Tornado Dragon from his Graveyard. He Special Summoned Overtex Qoatlus from his Deck and then Special Summoned his banished Giant Rex with the Rex’s effect. He Normal Summoned Lumina, Twilightsworn Shaman next, and attacked directly with Lumina and Qoatlus. Salazar dropped down to 2200 Life Points. Salazar drew a card and then Normal Summoned Sky Striker Ace – Raye. He attacked Lumina to destroy it with Raye, and then used Raye’s effect to Tribute it and Special Summon Kagari from his Extra Deck. He used Kagari’s effect to add Sky Striker Mecha – Shark Cannon from his Deck to his hand and then entered Main Phase 2. He Set a card to his back row and then used Kagari as a Link Material to Link Summon Sky Striker Ace – Shizuku. He used Shizuku’s effect to add Sky Striker Mobilize – Engage! to his hand in the End Phase. Magdaleno drew Phantom Skyblaster! He Summoned it and used its effect to Special Summon 2 Tokens to the field! Then, he combined Rex and Phantom Skyblaster to Xyz Summon Number 39: Utopia, upgraded to Number S39: Utopia Prime, and finally Xyz Summoned Number S39: Utopia the Lightning! An attack from Utopia the Lightning over Shizuku ended the Duel and the Match! 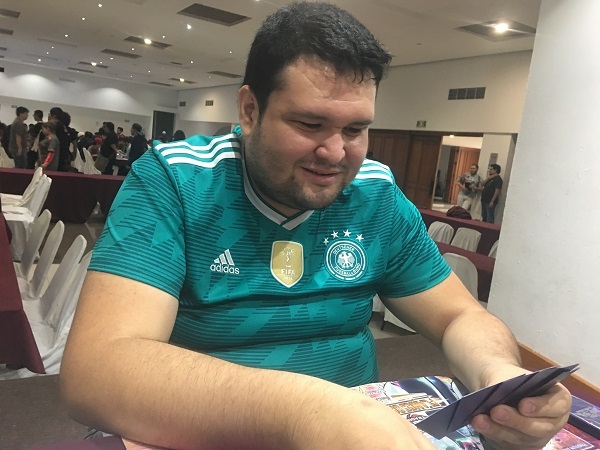 Edgar Jaime Magdaleno Gomez takes the 2-0 victory with his Dinosaur Lightsworn Deck and advances in the Central America WCQ with a 7-2 record!